Inder Loves Folk Art: KCWC Days 5 & 6. Friday, Day 5 of KCWC, was a total bust. The only sewing-related thing I did was to trace the Easy Linen Shirt pattern from Sewing For Boys. Did I then cut it out in a delicious linen and start sewing? Well, no. Actually, I went to bed. Now that I've hit 28 weeks, I am starting to really feel pregnant - a bit big, unwieldy, and tired. A long week of staying up late after work sewing finally caught up with me. The next day, Day 6 of KCWC, I decided I wasn't quite ready to dive into an all new pattern, and cut out another Flashback Skinny Tee instead, in a nice shade of yellowy-green. 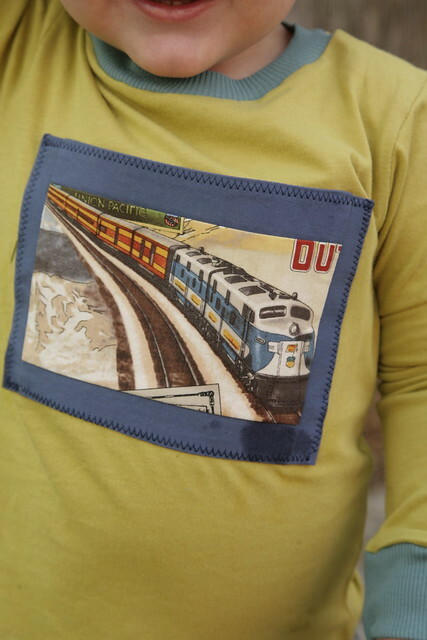 This time, I added a cute train applique using some travel-themed fabric that I've used for this purpose before. And yes, five minutes after I've put it on him, he's already gotten it wet playing in the small fountain Steve set up on our back patio (which has provided hours of entertainment to Joe, by the way - what a great investment!). I love the color of this knit and the applique turned out pretty well (despite the orphaned letters "OU" on the upper right corner of the applique), but this was not an unqualified success. As you can see in these photos, the sleeves are too long and all of the ribbing looks wonky and wrong. I think I stretched the neckline more on one side than the other, which is making the neckline lay funny. The width of the ribbing on the sleeves needs to be shorter than the circumference of the sleeve and it's not (I also need to shorten the sleeves by an inch lengthwise). End result - it looks like a beginner home-ec project. I'm still getting the hang of this pattern, but at least I have a good idea of where this went wrong. So, basically, I need to rip out and redo all of the ribbing. Sigh. I'm not a perfectionist by any means, but I know I can do better. But with the ribbing issues debugged, I think this will be a really cute "summer in the San Francisco Bay Area" shirt. As KCWC draws to a close, it is apparent that I have lost a lot of steam. I do have a fun final project planned for today, though! That applique is darling. I love how it kinda looks like a photo or a mini tv screen. I gotta sew something like this up for Elena once my knit-intolerance clears up. Thank you! Yes, I really wanted to frame the train and I was digging the idea of lots of different but complementing shades of blue, blue-green, and green. This is as close as I get to "quilting" these days, hahaha. I really love it though. Awesome job on that applique and the colors are right on. Hi Rae!! Thanks for stopping by! I think you've hit the nail on the head - the ribbing, harvested from a thrifted rib tank, is super soft and stretchy. I've picked it all off (while watching bad television and vegging out) and I think I'm going to trim a bunch off and try again. It has a lovely texture, and the color is perfect, so I want to make it work! But the other two shirts (one blogged, one to be blogged soon) I've made with this pattern and used a stiffer and less stretchy rib turned out with no issues at all, so I do think a more stable rib makes things easier. Step away from the whip Inder! This is so great. I never even noticed those little things, I'm still finding it hard to spot them. Just lurve that colour and the applique and ribbing. It all works so well. Good on big ol' pregnant you. That boy can rock a bit of slightly wonky handmade love :) And - squee - you got a comment from Rae, golly, I get all starstuck, haha! 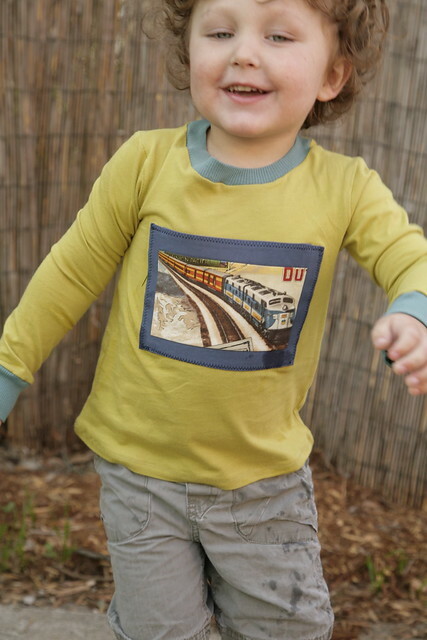 This is seriously darling - I love the applique and I'm dying to try this pattern, especially now. I love your version! i love it! i think it looks perfect.